Peas are in season in April! You don’t have to be a gardener to enjoy an abundance of peas during pea season. There will be peas at the farmer’s markets, discounts on them at the grocery store, and perhaps you’ll even have friends and family members pushing their excess peas onto you if you are lucky. Planning your meals around what is in-season is an excellent way to save money and eat fresher, and it’s also a good idea to stock up on the frozen version of the fruits and vegetables that are in season. I just put some peas in my garden bed, and by planting some new seeds every 2-3 weeks, I think we will keep a steady batch of peas coming in until we’re ready to make way for tomatoes and other summer crops. This means we will have peas coming out of our ears! If you’ll also have peas coming out of your ears, you might want some ideas for what you can do with them. I know I’ll be needing some ideas, so I’ve collected some from some food bloggers to share with you. I think that all but the first one of these is gluten free too, in case you’re looking for recipes like that! 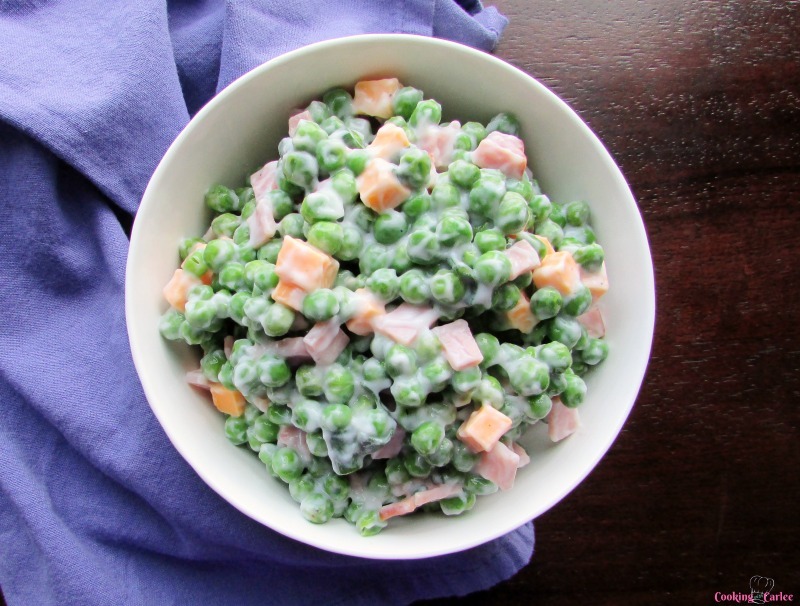 What goes better with peas than ham and cheese? Nothing. 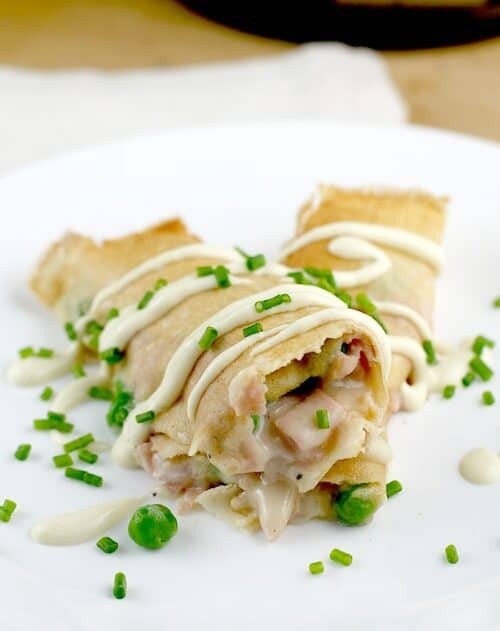 Erica, with Erica’s Recipes, describes her dish as “Tender tasty ham and spring peas, loaded into delicate crepes with an abundance of cheese,” and I am sold! I will be making this just as soon as my peas are ready. I can’t wait! I’m even excited about the dijon cream sauce that she has drizzled across the top, and I believe my garlic chives will be ready in time to garnish this with. According to Erica, this is a recipe that makes her look like a rock star without her having to work too hard. These are my favorite types of recipes, the ones that are super easy but still impressive. This is one of those beautiful looking dishes that you can proudly bring to a potluck, looking all fancy, but that is so simple to toss together that it won’t be any trouble for you. Another thing I love about this recipe, which may not matter to you but it is awesome for me… I have this same exact dish! I found it at Goodwill for 3.99 and it is WONDERFUL for displaying decorative foods like this. It’s also great for fruit salads, layered cakes, and even basic and pasta salads. I love being able to see the food through the glass. If you want to shop for similar bowls to show off your own food, I found a similar one on Amazon here: Anchor Hocking Monaco Trifle Bowl . I can’t turn away from a recipe that claims to be from a grandma. Grandma’s have a way with food. It’s like they’ve learned to make it sing to every taste bud before going inside to comfort your very heart and soul. If you have a grandma that makes pea salad, you should definitely go for her pea salad. It will probably be the best to you. If your grandma specializes in other things and doesn’t tend to do a pea salad… you can borrow this one from Kelly’s grandma. Kelly is the owner of the blog Trial and Eater. She focuses on recipes that are mostly healthy, and also vegetarian. Sometimes they are also vegan. This recipe includes hard boiled eggs, and it looks amazing! To be honest, I would personally add bacon and cheese cubes to it, because that’s just my thing, but I would still otherwise follow this recipe because it looks like it was made by someone who has been doing this for many years! Speaking of her grandma’s experience, she shares a few other recipes of hers as well: Grandma’s Meatless Baked Ziti, Nana’s Potica. and Broccoli Crescent Wrap. Here’s a lightened up version of pea salad by Cooking with Carlee that you can enjoy. She doesn’t use a bunch of gross, fake ingredients to lighten her version up either. She uses some nice and healthy Yogurt. If you’ve caught any of the yuckies over the winter and early spring, and you’ve had to take any antibiotics, you actually need the probiotics that are in this recipe (because of the yogurt), and it is also packed with other vitamins as well. I have heard the recipe is really delicious also, so lets eat it up! I especially love potato salad that is so good that Erica from Erica’s Recipes has accidentally eaten half the bowl before taking the picture you see here. She’s a scientist, by the way. Cooking and baking really is a science, and I tend to really trust her recipes because I know she is crafting them with a scientific mind. She’s the creator of the ham and pea crepe recipe above on this page, and she also is the creator of the amazing Easy Fish Gyros, and another recipe that uses peas as well: Simple Ravioli Marsala with Mushrooms and Peas. I’m a big fan of curry soup. I especially like coconut curry soup. Nobody else in my family does, though, so I don’t have it very often. Once there are peas shooting out of my ears though, I may need to make a giant batch of this and freeze it into sections…and then I will reheat some up for my lunches whenever I’d like. There are also a lot of recipes without curry, including barbeque recipes, some spicy recipes, and plenty of desserts. She focuses on gluten-free recipes, and since I have a loved one who has Celiac disease, I do plan to collect some recipes from her site. They all look really good! As someone who LOVES avocados, I have to admit that this feels like blasphemy… BUT, look at this photo. Doesn’t it look good? Peas are a lot more affordable here in the Pacific Northwest than avocadoes for sure! The garden will be going wild with them soon, and I do think that I want to make lots and lots of this dip. This is also a fat-free version of Guacamole. Avocado is a super-healthy fat, and so I don’t think a person should avoid them, but sometimes we’ve already had our healthy fats and we want something to dip our healthy veggies (or our chips) in. This recipe is from Looney for Food, and they will show you how to make healthy food taste good. This is definitely one to subscribe to! Please share with me, how do you like to eat your peas? Do you have any special recipes you would like to share? Do you have any super-secret pea recipes that you will taunt us with and never ever share? Please taunt me in the comments below! If you’d like to see my post about planting peas into my special raised bed (made by my dad by a tree my grandpa planted) click here. My husband and I are already in the process of improving on this garden, so more posts should be coming soon! Do you want to see some other compilation posts I’ve done? Try this bacon-themed one! Don’t forget to friend me on Facebook if you want to see what I’m up to more regularly. Why use a pressure cooker to cook Corned Beef and Cabbage with Red Potatoes? I’ve seen a lot of Instant Pot and pressure cooker Corned Beef and Cabbage recipes that were faster than mine, and I could shorten mine too; I just found it necessary to work in steps, adding each thing at its own time in order to get the right consistency and flavor. I’ll share some tips to cut down the time below, and the food will still be good… I just couldn’t bring myself to do it because I just know that something will get a little more or less cooked than I would like if I skipped a step. Still safe, still delicious, just not as perfect as it could be. I like to try to get my corned beef and cabbage perfect. Because of the time it takes to increase the pressure and release, adding each thing at its own time increases the recipe time substantially…so doing it in the instant pot will only save around 30 minutes of your time at most. However, the results are some super tender, juicy, and tasty corned beef; and you don’t have to pay as much attention to the water level. It is still worth it to use your pressure cooker for this recipe. If the main reason you are using your pressure cooker to get the meal done faster, no problem, here are some options to reduce the time. Cook some, or even all of the vegetables separately. Instead of releasing the steam, adding an ingredient, and then letting the pressure build again…you could just start another pot for the potatoes about 10 minutes before the corned beef is done, and then add the cabbage at the last 4 or 5 or so. This allows the meal to get done just as the meat is ready, and you could be eating in as little as an hour, but your vegetables won’t be braised in the flavorful broth of the corned beef. Add the cabbage and potatoes together. Either put them both in and pressure cook for about 4 minutes or put them both in and steam for about 10-15 minutes. This runs the risk of your cabbage getting a little softer than you may like, or your potatoes remaining a little more firm. They won’t be a perfect consistency, but they will still be really good. You could put the potatoes in with the corned beef, and then add the cabbage to steam for the last 4 minutes, or even just steam the cabbage in a separate pot and put butter over them for flavor. This will make your potatoes really soft. They might just as well be smashed or mashed potatoes at that point, and there is nothing wrong with that! Other than that, I really don’t recommend putting all the ingredients together and pressure cooking it for the same amount of time. I used to cook it that way in the stock pot when I was a beginner, and it was still absolutely delicious. I wouldn’t recommend it though, now that I know how to make it better. The beer is optional. The beer is always optional in the recipes I make and can either be simply omitted, replaced w ith a cooking liquid, or replaced with something else. In this case, the beer is just a liquid, and more water would be fine…but the beer is also a meat tenderizer (or so I’ve been told, I’m not actually an expert). dash of apple cider vinegar in this recipe. If you don’t though, no big deal, just make sure there is plenty of water. It’s also fine to use broth, but it really isn’t necessary. Corned beef is a salty and flavorful treat on its own, and the water is going to turn into a delicious broth anyway. Save your broth for a recipe that needs it, in my opinion. You are basically making a stock that the corned beef will be sitting in. You’ll be removing these ingredients before adding the potatoes, so you’re just flavoring the water. If you don’t happen to have every one of these ingredients in your fridge…don’t put off making the dish! I like to keep the odds and ends of my veggies, from when I’m making other things, in a plastic bag in my fridge. When I make any kind of a stock or broth, I can dump it in for the flavoring. So feel free to add bell pepper tops, onion ends, dry herbs, leeks, even some lemon peels– anything you would put in a stock. Do you have something that needs to be used up? You meant to use some green onions or leeks, but accidentally ordered pizza instead? Don’t let them go bad, use them for stock! You don’t want things to get too mushy. If you want your cabbage and potatoes cut into little tiny bite size pieces, you should probably wait until the meat is done, strain the juices into a pot, and cook them separately. I have cut pretty good size wedges of the cabbage, and have cut the red potatoes in half. If you’re lucky enough to find those little, bite-sized red potatoes…put them in whole. If you can only find the fairly big ones, cut them in quarters. These basically being cut into big bite sizes. If they are small enough to give to a toddler without cutting them smaller, then you will not want to cook them for the time I listed. I’m not positive you’d want them in a pressure cooker at all. Let me know if you have any questions about this recipe. If you’ve found an error or something didn’t work, please bring it to my attention. I do my best to list all my steps, but it just happens that sometimes I leave something out. If you tried it and like it, please rate and review it below, and feel free to share any tips and tricks that you have and use for your Corned Beef and Cabbage! This recipe is for pressure cookers that have a saute’ option. If your pressure cooker doesn’t have this option, just pressure cook it for 15 minutes, release, skim the foam from the top and then pressure cook for another hour. While this method doesn't end up saving a lot of time, the outcome is some tender, juicy and flavorful corned beef, with perfect cabbage and potatoes. Remove corned beef from packaging, rinse and pat dry. Place corned beef in a pressure cooker, cover with beer or vinegar, peppercorn packet, and water. Set cooker to saute for 30 minutes, then skim the foam from the top. Lock the lid in place and set the valve to sealing/pressure position. Release the pressure valve and allow all steam to escape before opening the lid. Add potatoes to the pot. If they are bite size, put them in whole, otherwise cut them into half or quarters, into a large bite size. Put the valve back into the pressure/sealed setting and set the cooker to soup/stew for 10 more minutes. Release the steam again, and add the cabbage wedges directly into the liquid. Lock the lid back on. Set the cooker to steam setting, and steam the cabbage for 3 minutes. Remove the lid, carefully remove food from the liquid onto a serving platter. Slice the corned beef against the grain and serve with mustard. Do you ever throw something together and then get really excited because it turns out amazing? That’ s how I felt last night when I tossed these ingredients into the Vitamix blender and ended up with my new, favorite, creamy, and healthy Avocado Dressing! Push the “Jump to Recipe,” or “Print Recipe” buttons above if you want to get right to the recipe! I haven’t been perfect in my goal to stick to real ingredients, at least 6 days per week… but I am pretty proud of myself that I haven’t been using the bottles of dressing in the fridge. Each time I’ve put together a salad, I’ve made a simple dressing to go with it. It’s often an afterthought though, because I’m not used to it…so the dressings I put together are pretty simple. Well I happened to have a ton of Avocados in the fridge because I was going to make guacamole for the Super Bowl, but a friend brought an amazing one, so these were stills sitting in there. When I reached into the fridge for the ingredients for a basic Italian dressing, I realized I could do something even better! Of course dinner was ready (thanks to my new Instant Pot!) I didn’t have a lot of time to hunt down a perfect recipe, so I just grabbed some things I had on hand that I assumed would make a good dressing, and I’m so glad I did! Avocados, lemons, cilantro, Greek Yogurt, garlic, and broth. Oh, and don’t forget plenty of salt and pepper. I forgot the salt and pepper at first, and that wasn’t going to hit the spot. Once the salt and pepper were in, it was perfect! Every single one of the ingredients in this dressing has great health benefits for you. Every. Single. One. You know what isn’t in this avocado dressing? There is no high fructose corn syrup, caramel color, Propylene Glycol Alginate, Potassium Sorbate and Calcium Disodium Edta, Red 40, Xanthan Gum, Monosodium Glutamate, Modified anything…. Are all those ingredients bad? A couple of them are really, really bad, and some of them I honestly couldn’t tell you because I don’t know what they are. I do know that I don’t want to put a bunch of processed stuff into my body anymore, and making it with a handful of healthy ingredients is the best way to avoid that stuff… and it tastes way better! Lets just start out by saying that Avocados are one of the healthiest things you can eat. If you’ve read my article about why I quit Weight Watchers, you probably know that avocados were involved. More specifically, it was tempting to eat fat free products in order to “afford” the other things, and avocados were expensive. I felt like crap and even went to the ER at one point. Avocados are good for your heart, hormone balance, digestive health, insulin balance, cognitive function, cancer prevention, your metabolism, hair, skin, and eyes. They can also be helpful in weight loss. They are full of Vitamin A, E, K, B, & C, and have the minerals magnesium, potassium, iron, copper and Fiber. There are many sources for this information, but I got all of this from Dr. Axe, and this barely scratches the surface of his really cool article about Avocados, including charts. Here’s a good article on the health benefits of lemons, including some remedies. Broth is healthy for you, and bone broth has been said to have even more benefits. I enjoy following the blogger The Wellness Mama, and here’s an article on the benefits of Bone Broth. As if garlic isn’t awesome enough as a heavenly, fragrant food that often hangs out with butter… There is science backed evidence that it is incredibly good for us. Here’s the article on the 14 Science-Backed Health Benefits of Garlic. Here’s another Dr. Axe article, this one will get you excited about eating cilantro, including that it can help with sleep. There’s actually some arguments over whether or not Greek Yogurt is as healthy as we all think. You can go down that rabbit hole if you want. I’m choosing to believe it has great health benefits for now. All I really did was throw everything into the blender, after peeling the garlic and avocado of course, and then hit blend. I didn’t have to do any chopping or anything. Cleaning the blender is easy, because you can just blend soapy water in it to clean it out. So this is one of those dressings I can do when I suddenly realize I forgot about dressing. Look at how creamy and delicious this simple salad looks now! Super easy, creamy, healthy and delicious avocado dressing. Peel and pit the avocado, place in blender. Peel the garlic and place in the blender. Add remaining ingredients into the blender. Salt and pepper until you enjoy the flavor, blend once more.